Passion flower vine is a tender evergreen vine native to areas of South America. The passion vine is available in several varieties that thrive in USDA hardiness zones 6 through 11. Varieties of passion vine that are hardy in areas with cold winters will die back in the winter months and regrow in spring. Passion flower vines are fast-growing, so they should be placed 10 to 15 feet apart when planting. Choose a planting location for your passion vine that has well-drained soil and full to partial shade. Wet soil will increase the chance of the plant developing root rot. Planting near a wall or patio will offer protection during periods of frost or cold weather. Test the soil pH in the location, because passion vines prefer lightly acidic soil with a pH of 6.5 to 7.5. Add ground rock sulfur to lower the soil pH number, or add limestone to increase the pH number. Let the soil rest for two weeks after making amendments before planting your passion flower vine. Dig a hole that is twice as wide as the container your passion flower plant came in and the same depth. Remove the plant from the container, and set it in the hole, making sure the top of the root ball is at ground level. Mix equal parts of organic compost into the removed soil to increase its nutrient value and moisture-retention properties. Gently fill the hole around the plant with amended soil, and pack it in place. 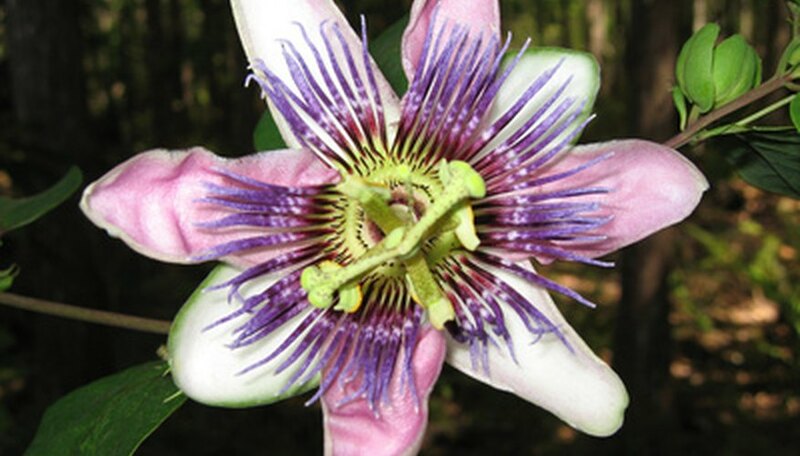 Water your passion flower plant generously immediately after planting to stimulate root growth. Water passion vine plants to keep the soil moist during the growing season. This will promote flowering and fruit production. Do not allow standing water around the plant. Fertilize the plant with a 10-5-20 fertilizer in the spring. Repeat the fertilizer application three times during the growing season for a total of four applications. Do not use a nitrogen fertilizer high in nitrogen, because it will promote foliage growth instead of flower and fruit production. Place a heavy-duty trellis behind your passion flower plant to offer support for the heavy fruit and vine as it grows in length. Prune your passion vine in the fall and winter months by removing one-third of growth. Cut to remove all weak and dead growth. Propagate passion vine plants by collecting seeds from the fruit. Plant fresh seeds at a depth of 1/2 inch in growing flats filled with sterile seed starting soil that is lightly moistened with water. Place the flat in a warm location with indirect sunlight during germination, which will take 10 to 20 days. Once they reach several inches in height, transplant seedlings into 3-inch growing containers filled with sterile potting soil. Transplant the seedlings outdoors once they reach a height of 10 to 16 inches. Monitor your passion vine plants because a root fungus infection is common in some growing areas. Vines that form a canker or stem lesion close to the soil level are infected with a fungus that will eventually kill the plant. Remove and dispose of the diseased passion vine and root system. Plant a new passion vine in a different location, because the fungus will still be present in the soil. How Fast Does English Ivy Grow?